As long as this card remains face-up on the field, your opponent cannot draw a card(s) except during Draw Phases. It could have actually had a decent deck if the urge to destroy gamebreaking combos didn't get it restricted. *Protector of the Sanctuary + Morphing Jar: You get your 5 and the opponent gets nothing. This one's legal because you don't know that it'd force a draw while it's face-down and it's still legal to flip Jar with him on the field, so the effect is carried out as much as possible. *Disturbance Strategy + Call of the Haunted on Protector: They'd have to shuffle in their hand and draw nothing. *Card Destruction + Call of the Haunted on Protector: Discard their hand + no draw. All this might actually see some play today if it was legal to play 3 Protector of the Sanctuary. But since the powers that be decided everyone would shift over to this kind of deck and try to abuse Morphing Jar, he gets screwed. Try him in a side deck if you main Morphing Jar and/or Card Destruction (Dark World, I'm looking at you!) and you might hit someone off-guard. As long as this card remains face up on the field, your opponent can not draw a card or cards outside of his/her draw phase. Now, here's an interesting card, that sadly isn't so good with Pot of Greed AND Graceful Charity banned currently. Protector of the Sanctuary is a Fiend though, so it could at least be food for Dark Necrofear. 1100 attack isn't that great, but 1900 defense could last at least for a turn or two. Even with Pot and Graceful gone, it could still negate Jar of Greed, Upstart Goblin, Reckless Greed, or even Pot of Avarice. Traditional: 2.25/5 At least here, it might do something. Advanced: 2.50/5 Still not that great. I guess this can work against MPT, or FFC. But...no =/. I mean, test it if you want, but there really is no use for this card, and you probly won't see it in a top 8 decklist anytime soon, even at regionals. PotS is a very interesting monster, and what I consider key in a Dark World deck, and a card I considered running back with my fiend deck. Its effect is very unique , not allowing an opponent to basically use card effects to draw. Combo this with Dark World and a Card destruction and they are in for some hurting as you get a full field of monsters, the same hand count ( minus CD) and the opponent gets nothing. This is beyond evil. With 1900 def this card can hold its own, as well as making a small wall. 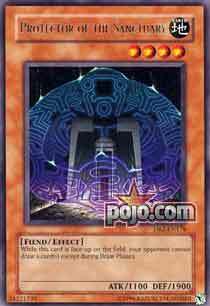 Definitely an evil card to use if you can utilize its ability with your deck. Also , it make a nice Smashing Rod. Traditional : 1/5 Too much removal, but at least here it can stop Pot of Greed and the like. Art : 3/5 - Not bad, bit basic.